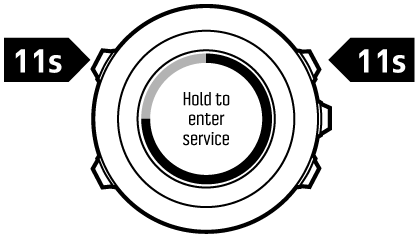 To access the service menu, keep Back Lap and Start Stop pressed simultaneously until the watch enters the service menu. Power off is a low power state. Connect the USB cable (with power source) to wake up the watch. The initial setup wizard starts. All settings except time and date are maintained. Just confirm them through the startup wizard. The watch switches to power saving mode when it is static for 10 minutes. The watch re-activates when moved. Service menu content is subject to change without notice during updates. In case the GPS unit cannot find a signal, you can reset GPS data in the service menu. In the service menu, scroll to Action with Light Lock and enter with Next. Press Light Lock to scroll to GPS reset and enter with Next. Press Start Stop to confirm GPS reset, or press Light Lock to cancel. Resetting GPS resets GPS data, compass calibration values and recovery time. Saved logs are not removed.